NYC isn’t the only place to find an excellent brunch. Hop on a bus or Amtrak headed to Philly and take the Market-Frankfort Line to the Spring Garden station. 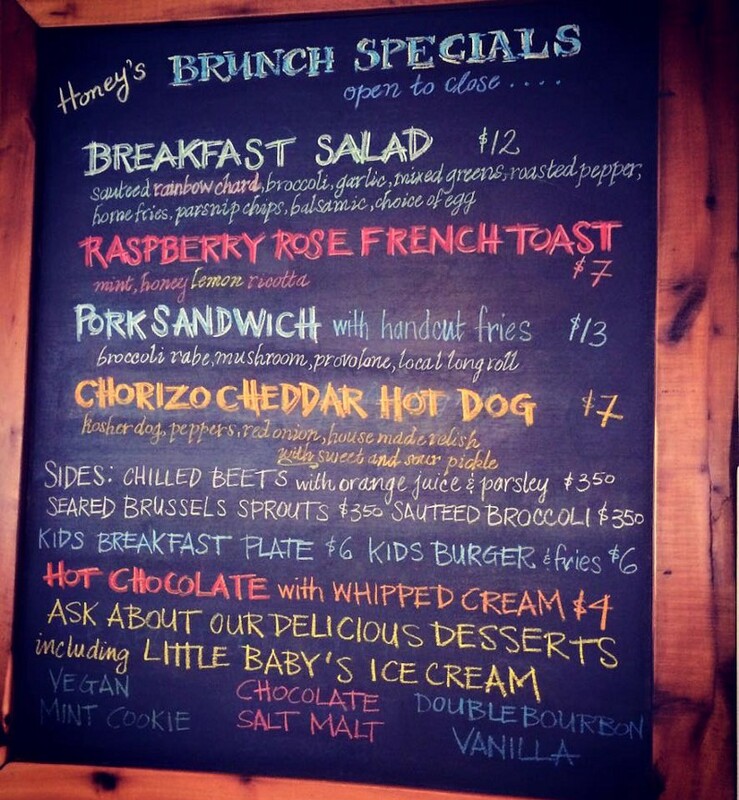 You’ll find a magical gem of a restaurant in the quaint, historic Northern Liberties neighborhood called Honey’s Sit ‘N Eat. The unassuming wooden sign hints at the location where you will inevitably find hungry folks milling about on a Sunday waiting for their party to be seated. The interior is dim, reminiscent of a classic diner with a woodsy feel. The food is primarily Southern, with a Jewish influence. This is the first stop I make whenever I come to Philly… and sometimes my sole reason for the trip. The menu is extensive, filled with welcoming homestyle dishes and some that will make you reevaluate how you do breakfast. The Breakfast Bomb, as delectably described on their menu, is a GIANT buttermilk pancake stuffed with scrambled eggs and your choice of any Mornin’ Meat (I highly recommend the local pork sausage). 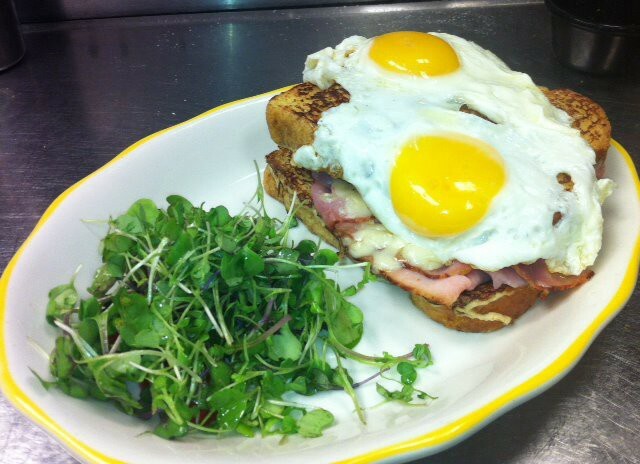 Its close cousin, the Honey Cristo, is Challah French toast stuffed with Lancaster County double smoked ham and Swiss cheese, topped with two sunny eggs and served with a mixed green salad. Yeah, man. *Pssst* Lean in… while it’s not on the official menu, there used to be a mac n cheese stuffed pancake. I was put off initially… until I tried it. Sweet, savory, cheesy, with a bit of powdered sugar and maple syrup. It’s devine. I’ve, unintentionally but not regrettably, stayed here from brunch to dinner. Their location on South Street in Center City has later hours. Take advantage of them and bring plenty of cash you glutton- credit cards not accepted. Professional skeptic, esteemed taste-tester (just ask my mother), photographer, dry humorist and constant learner. Founder, Extraqueericular.